Interests: Men’s Health, Preventive health, Cardiology, and Paediatrics. Consults: Monday, Tuesday, Wednesday, Thursday and Friday. Roy graduated from Monash University in 1995. He then spent four years working in a variety of medical and surgical sub-specialty rotations at Monash Health, in Warrigul and at Sandringham Hospital. Prior to joining Bluff Road Medical in 2010, Roy was in General Practice at Rowville, Cranbourne and East Bentleigh. Roy believes in taking a holistic approach to health and has developed an interest in Sleep Disorders. 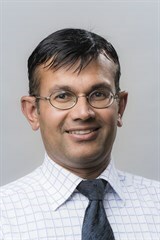 He has completed a Diploma in Child health, is a Fellow of the RACGP and is one of the few GP members of the Australian Sleep Association. In addition to his clinical practice, Roy is a Medical Educator with Eastern Victoria General Practice Training and assesses GP trainees. In his spare time he enjoys travelling, cooking and spending time with his wife, and driving his son and daughter between sporting activities.